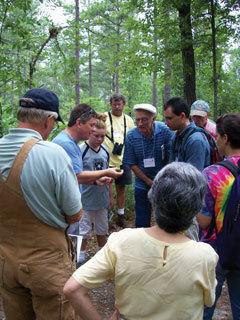 Forest landowners learn how to identify common Virginia woodland trees. BLACKSBURG, Va., Oct. 6, 2010 – Virginia Cooperative Extension and the Virginia Forest Landowner Education Program in Virginia Tech’s College of Natural Resources and Environment will hold their third annual Forest Landowner Weekend Retreat Oct. 30-31 at Twin Lakes State Park in Green Bay, Va. Sponsoring partners for the retreat are the Virginia Department of Forestry, the Virginia Department of Conservation and Recreation, and the Ballyshannon Fund, a private fund in central Virginia focused on landowner education. The cost of the weekend retreat is $45 per person, which covers all meals, presentations, and materials. Participants should make their own lodging arrangements — cabins and camping are available at the Twin Lakes Park, and several hotels are located in nearby Farmville and Burkeville. Register online at the Virginia Forest Landowner Update website. The deadline to register is Oct. 23. For more information, contact Jason Fisher or call (434) 476-2147.